How do we end up in our personal (and public) situations? How do children with big problems, those born into poverty, ignorance, and crime, find real happiness inside a box of paints or a piece of cake? I saw them with my own eyes, two hundred K-3 kids at New Orleans College Prep, a public charter school for grades K-8, expanding soon to K-12, available tuition-free to all children in Orleans Parish, regardless of demographics. With dedicated and highly skilled teachers and a hands-on principal, this school instills a desire for college from day one with strict academics and discipline, a code of honor complete with advanced concepts and vocabulary, and a tremendous amount of fun, such as the zoo, sports, music lessons, art therapy, and dance. In a school in which more than eighty percent of their parents lack a high school diploma, these students have their eyes set on college and their hearts set on the person sitting next to them. I spent much of this week thinking about growing older and about life’s circumstances. I should have been born twenty years earlier, I thought to myself as I toasted John Bullard, a dear friend and the former director of the New Orleans Museum of Art, who recently retired after thirty-seven years. Looking around the room, I couldn’t help but wonder what I was doing there, why I was included among this distinguished group. 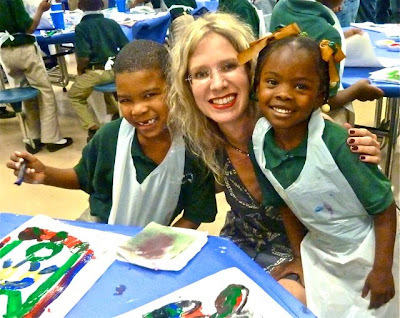 I fought back thoughts of losing my friends, so many of them approaching seventy, eighty, and even ninety, and all of them significant contributors to the arts in the New Orleans community. “…To share with others our appreciation of the benefits and obligations of freedom…” from the “Bill of Responsibilities” of the Freedom Foundation of Valley Forge. You are my favorite type of audience, I told them, as George painted for an hour alongside me. 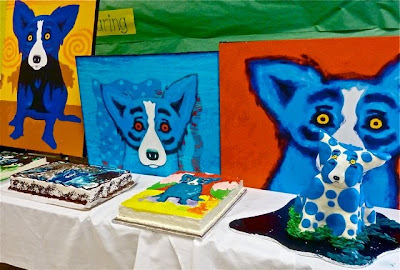 They already understand Louisiana terms such as loup-garou and Jolie Blonde, and their art knowledge opens my discussion of Rodrigue to comparisons with Degas, Picasso, and others, along with an easy understanding of his academic roots, namely the 1960s art scene. These teachers share the arts with their students. 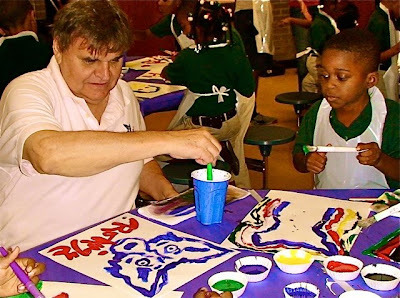 They are the administrators of our goals through the George Rodrigue Foundation of the Arts. Without them, none of it works. What did we do with our time before we had a foundation? 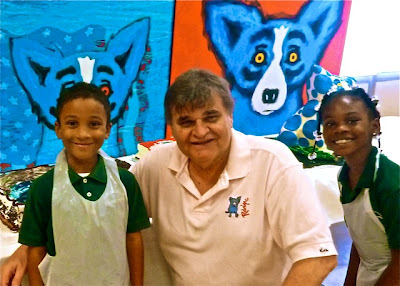 I asked George Rodrigue this week. “Book tours and museum shows,” he reminded me. This is very inspiring. Miss you guys. By the way, I think George needs to revisit that mustache!!! Very nice Wendy. I appreciate you sharing this experience w/ us. Looks like your foundation is doing very good things for those less fortunate. 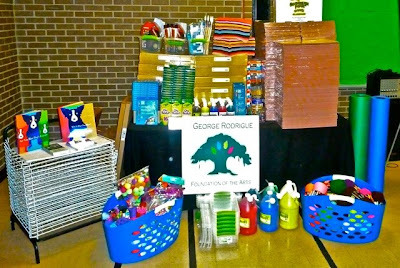 Wow, those kids are lucky - not only to go to such a great school but to have you and George visit, donate all those materials and to provide a painting demo. 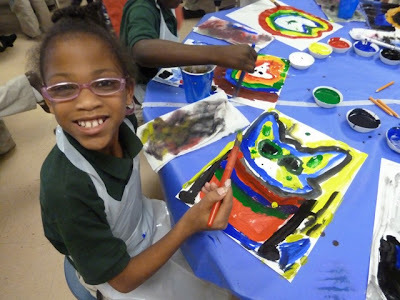 It's wonderful to see kids mess around with paint and have a great time. 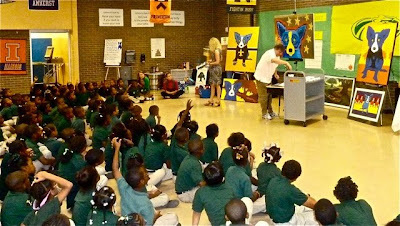 Maybe your visit will even inspire them to pursue art as a career.